You, Me and Movies: Jack Reacher: Never Go Back...to the theater! I really liked the first "Jack Reacher." I know this is an unpopular opinion due to his personal life, but I really enjoy Tom Cruise' presence in film. I think he really brings it when he acts and he is one of our few movie stars who can actually bring out the emotion and the detail of a character. There is a difference between a movie star and a movie actor, and Cruise makes walking that line look effortless. He's not the only reason "Jack Reacher" succeeded. It may have been a mystery, but it was filled with intrigue, grit and it was edgy. It created a world we wanted to know more about. 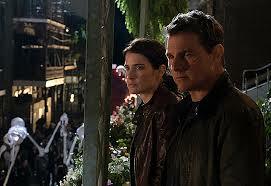 Instead of creating an intriguing mystery, "Jack Reacher: Never Go Back" just a familiar mystery. The film begins with one of its best scenes. We find a police scene, with six men laying on the ground. Whoever was in the fight with them, he absolutely pummeled them. Two sheriffs enter a diner outside the fight where the last one standing is staying. That last man standing is, of course, Jack Reacher. Apparently, these two are involved in something illegal connected to the military. Reacher has them arrested. He then gets a call from an old friend, Susan Turner (Cobie Smulders), who has been working in the military for awhile. She is then wanted for arrest due to espionage and murder charges. Reacher hops on the trail to find out if Turner really did these things. And this is about the time the movie begins to spiral out of control. There are only a couple redeeming factors involved. We have another good performance by Tom Cruise, who believes in everything he's doing, so the audience follows him. The action is top-notch and pulls into the film as well. But everything else? Its really not worth it. This is a plain thriller you'll see coming a mile away. Its turns into a cop-on-the-chase movie, trying to clear Turner's name, as well as Reacher's name. There is a cocky assassin in this movie, that we know Reacher will destroy in a fight by the end of the film, and of course, governmental corruption you see coming. There is also an obnoxious subplot involving Danika Yarosh who playing a girl who may or may not be Reacher's biological daughter. The only reason this subplot exists is to give the film's climax a weak emotional attachment for Reacher, which ends up coming off supremely stupid once we find out what happens in the end. I have seen Cobie Smulders in just about every episode of "How I Met Your Mother." I have seen her in "Avengers" and "Captain America: The Winter Soldier." I have seen her in "The Slammin' Salmon." I think she's a pretty lady, but she's just a pretty face. To me, she's always come off as somebody who just recites lines in front of a camera. I have never really got anything off of her as an actress. She's always come off as underwhelming, not who I would want as a lead actress role for this movie. Give her a cliched Politically Correct subplot, and you've got a stomach-turning mess. There are some good actors in this, including Aldis Hodge and Robert Knepper, but the script is so painfully familiar that I just don't see a point to any of it. No movie can just coast on good action or the charm of its lead actor. But "Jack Reacher: Never Go Back" attempts to pull it off with sickening detail. While there were minimal moments of this film that I did like, they don't come close to making up for the pointless sludge through this story.